Discussion in 'Rumor has it...' started by psiabeyl, Feb 18, 2009. WILL wedding bells be ringing soon for Rachel Bilson (above)? A Page Six spy spotted Bilson on a Virgin America flight from LA to JFK Monday night with her mom and tells us the actress is engaged to longtime beau Hayden Christensen. "A man sitting in front of her on the plane saw a ring on her finger and asked if she was married," said our snitch, who overheard Bilson reply, "I'm not married yet, just engaged. I know I look like I'm 15, but I'm actually 27." Her rep didn't return calls. People says engagement rumors are true!! Rachel Bilson and Hayden Christensen Are Engaged! 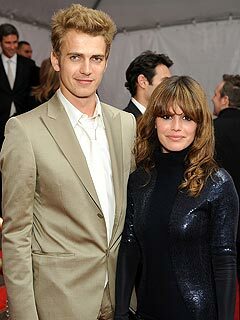 Rachel Bilson and her longtime beau, Hayden Christensen, got engaged quietly over the holidays, PEOPLE has learned. According to a friend of the actress, the two, who costarred in 2008's Jumper, got engaged in December. "They're so excited," says the pal, adding that no wedding date has been set. "They're a great couple. Rachel seems thrilled beyond belief." When contacted, Bilson's rep told PEOPLE, "I don't comment on my clients personal lives." A rep for Christensen could not immediately be reached for comment. The engagement news was first reported by the New York Post's Page Six. yay i m so happy for her!! They both make quite a good couple. If this is really true then I wish them both all the happiness in the world. Congratulations!!!! i thought he was gay. . .
what a great friend... spilling these news that the couple probably did not want it to be exposed. but if it's indeed true, congrats for them! but they seem like an odd couple.. rachel & adam were perfect but that's in the past. I didn't even know that they were dating. if its true, congrats to both of them. I think they look pretty good together, best wishes to them! + I hope they last. ..i'm still continuing to think he's gay, no matter what the news are. Congratulations to them both if they are indeed engaged how sweet . I know, I was like 'longtime beau? ', I don't know why I thought she was still dating that other guy from the OC. I love it how they say "longterm beau" as if they've been together for years and years... they got together on the "Jumper" set and that film was made in what, 2007?? Me too! I thought she was still seeing that Adam kid. whoops forgot to say I love Rachel but the two of them together seem fake and I really think she could do better.